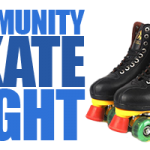 This program is designed to teach children how to roller skate, learn the sport of roller derby. The main focus of this program is sportsmanship, teamwork and self esteem while playing the sport of roller derby. Coed team, free of charge. Requirement is parents are responsible for WFTDA insurance. For more information contact 503-791-6064. ©2016 Friends of the Astoria Armory. Website by Redhare.